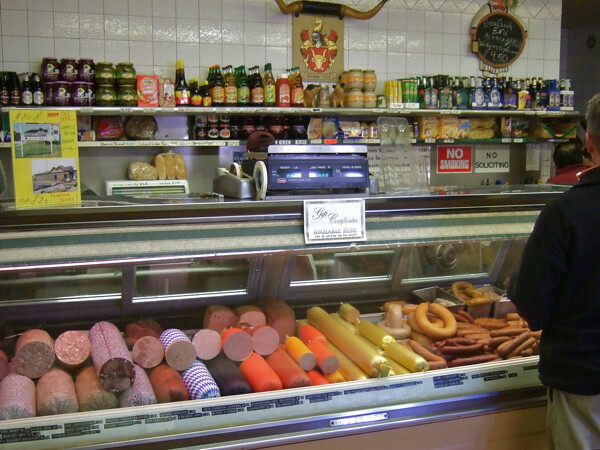 In the Indianapolathon thread Matt986 wrote: Assuming that you go to the Shapiro's on the south side of downtown (and I would highly recommend that), you should head over to a true Indy institution, Klemm's German Butcher Shop (South St., between Delaware St. and East St.). Klemm's is the kind of place that time forgot. Everybody who works there has a German accent and they quite often talk amongst themselves in German. Their cash register is circa early 20th century. All charges are hand calculated with a pencil on the white butcher paper that your order is wrapped in. And, of course, the meats and sausages are to die for. I always go to Klemm's for my ribs and Boston butts when I fire up the smoker. The sausages served at the Rathskeller and Biergarten come from Klemm's as well. There is an ugly rumor floating around these days that Eli Lilly is trying buy up the whole area that Klemm's is in to be part of their corporate campus. Given that they just tore down the building right next door to Klemm's I fear that it's probably more than a rumor at this point. I've also heard some rumors as to where they may relocate and, so far, the rumors have them moving to a location not too far from where they are now, which is a good thing because I live very close by. Thanks, Matt, for that tip. I visited Klemm's (now Claus') on my last trip and was tremendously impressed. I tried about half a dozen items and was very pleased with every one. Klemm's opened for business in 1913 at the City Market and has been at its present South Street location since the late 1960s when Gerhard Klemm, nephew of the founder, took over. It turns out that Klemm's as such hasn't existed since 2003 when Claus Muth, a master sausage maker from Frankfurt and nephew of Gerhard, took over the business and renamed it a few years later. The original recipes have been retained and from what I sampled I find it hard to believe the quality has slipped. Claus' is not a large shop but they make the most of their space. 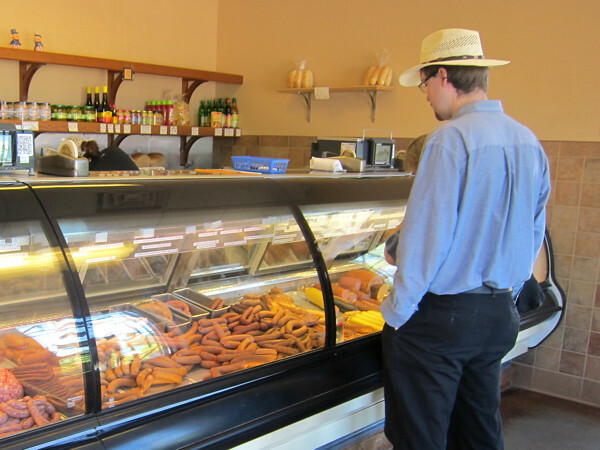 One cooler is devoted mainly to sausages, another to smoked meats, a third to fresh meats. There's also a small selection of German beers and condiments. I didn't pay too much attention to the fresh meats but everything looked good. All the sausages and smoked meats are their own production. Here are some pictures of those I tried. 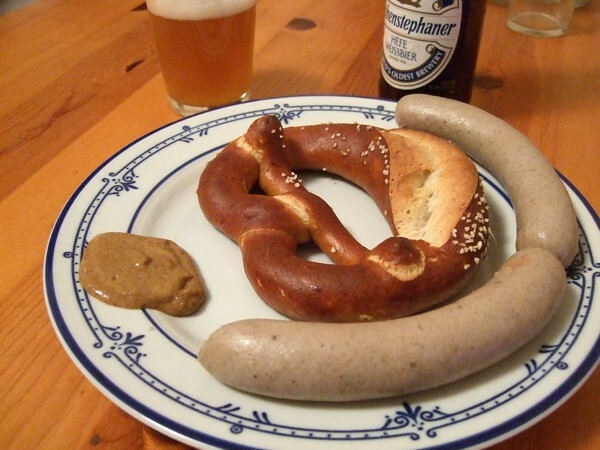 A pair of mild pork and veal sausages seasoned with parsley and green onion paired with a pretzel from Hannah's and a dollop of sweet mustard. Weihenstephaner, one of the classic weissbiers (and one of my favorites), was the obvious beverage. 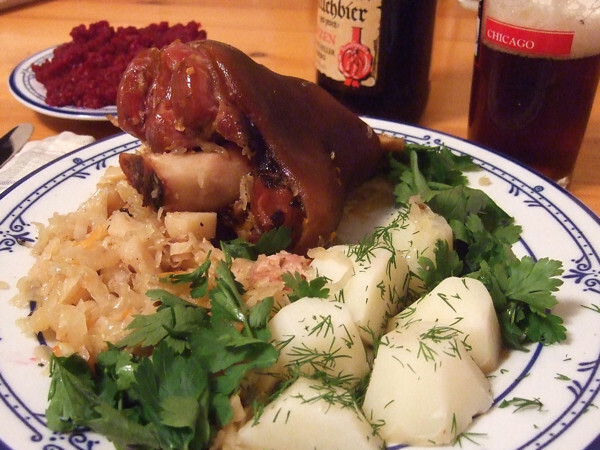 This nice meaty hock was cooked in a pot of sauerkraut and cubed parsley root. That's a shredded beet salad in the background. Schlenkerla Rauchbier seemed like a reasonable accompaniment. Even though I really don't care for "bacon beer" this was a thoroughly satisfying meal on a cold blustery night. Here's a piece of smoked ring liver sausage, one of Claus' four varieties, smooth textured with a hint of allspice and some mild smoke. Excellent. A couple pieces of landjaeger, one dry, another less so, are on the paper at the right. One of the best versions I've had. A jug of Won't-Go-Flat was the perfect accompaniment (in my dreams). 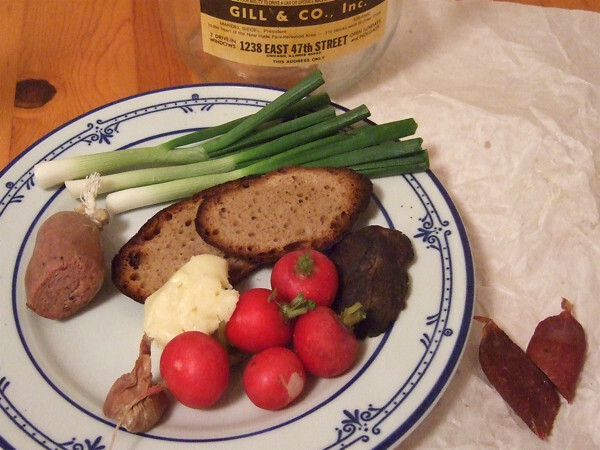 Actually I had a bottle of Pinkus Ur Pils that held up nicely to the mix of strong flavors (that aged brick cheese I brought back from Wisconsin was pungent indeed). 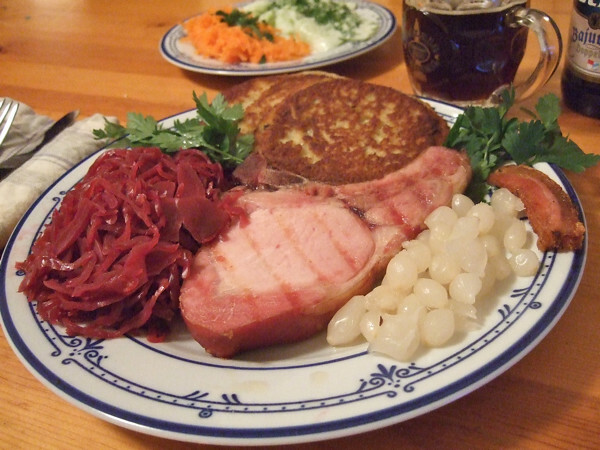 This smoked chop, cut to order from the whole loin, was cooked quickly in a grill pan and served with red cabbage, small onions and potato pancakes. The chop was very subtle, very juicy, absolutely top notch. I also had a small plate of cucumbers in sour cream and shredded carrot. Tucher Bajuvator, a pretty high octane doppelbock, meshed well with the slightly sweet, gently spicy meal. I now consider Claus' to be an essential stop any time I'm near Indianapolis. Sometime after Easter they will move about a mile to Shelby Street in the Fountain Square neighborhood. I hope they maintain their high standards, but I suspect they will. Edited to restore photo links. Last edited by Rene G on August 27th, 2015, 10:32 am, edited 1 time in total. Ooh, this looks goooood. Important question; do they have Leberkäse? I really miss that. Life is too short to eat bad food, drink bad wine, or read bad books. I'm pretty sure they make Leberkäse but unfortunately I didn't try any. I think you can even see it in the picture of the sausage case above—the middle of the three loaves in the back. I'm not sure what the other two rectangular ones are. 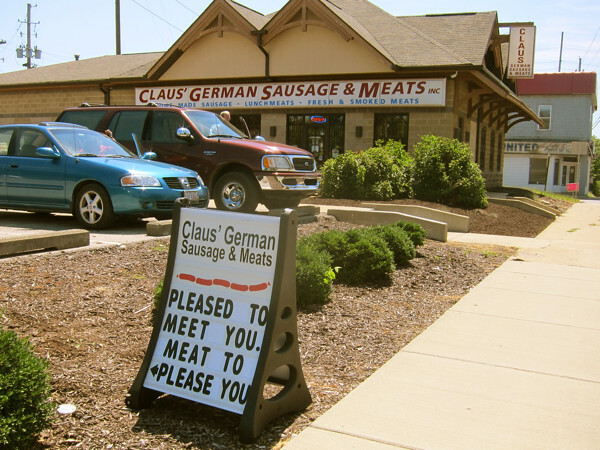 Rene G wrote: I now consider Claus' to be an essential stop any time I'm near Indianapolis. Sometime after Easter they will move about a mile to Shelby Street in the Fountain Square neighborhood. around about 50 years or so. ever meet run the place. 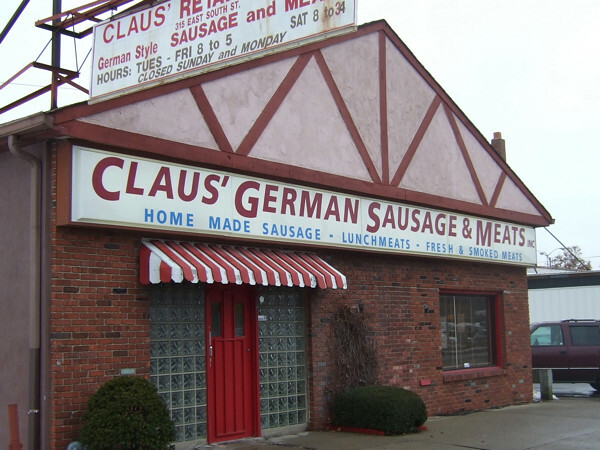 Claus’ German Sausage is now over a hundred years old and has been at its new location for eight years. The selection of large sausages, things like Gelbwurst and Zungenwurst, might be slightly diminished, but everything still looks and smells wonderful. One of the essential destinations in Indy (especially if you brought a cooler). Pleased to see that they are still going strong. And by the way - I think there is a banner quote in that sandwich board in front of the establishment: PLEASED TO MEET YOU. MEAT TO PLEASE YOU. Indeed.